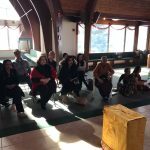 Sri Ramanujamji was the special guest speaker at the Madhura Utsav celebrations organized by the Boston Chapter of Gopa Kuteeram at Quincy, MA on the morning of Saturday, October 20th, 2012 at Bethany Church hall. 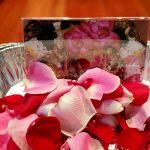 Hundreds of kids from ages 3-12 are being shaped and molded through ‘Gopa Kuteeram’ – a unique program of GOD and Oct 20th marked the celebrations of the Boston Chapter. The program started with a sweet display of young talent by 25 Gopakuteeram kids . The program started with their Mahamantra prayers and their flawless rendering of Adi Shankara’s Guru Ashtakam. This was followed by two plays – ‘Pundaleeka’ and ‘Senanayee’ – enacted with devotion by the young ones. 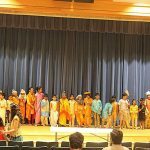 The kids were also given stage time to speak and they did a great job, each one giving a brief of the life and greatness of the Saints of India like Sri Adi Sankara, Sri Thyagaraja, Sri Tukkaram, Bhakta Meera, Sri Raghavendra etc. 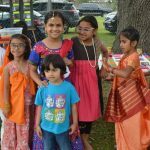 Kids from outside of the Gopa Kuteeram were given an opportunity to take part and display their talents through a fancy dress contest (for ages below 8 ) and pencil sketching contest (8-12). 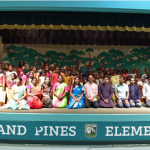 The adults were treated with a talk by Sri Ramanujamji who stressed on the importance of values – values arising from the various cultures – and how parents can enable their kids to imbibe these diverse values through Gopa Kuteeram. He also spoke on how parents could pass these values to their children by themselves living by them. About 110 adults and 45 children participated in the event. Many parents were inspired by Sri Ramanujamji’s talk and the kids’ performances and wish to enroll their wards in the program. 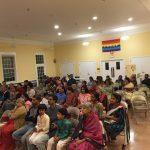 On Monday October 21st, Sri Ramanujamji had a session with the parents / volunteers of the Boston Gopa Kuteeram. He congratulated the children and their parents for their tremendous performance and commended the Gopa Kuteeram volunteers for putting together the grand event. The enthusiastic parents committed themselves to greater participation and involvement in the program going forward.